So as I get ready to begin my full-time career after college, I knew that it was time to invest in a work bag – aka, bye bye backpacks! 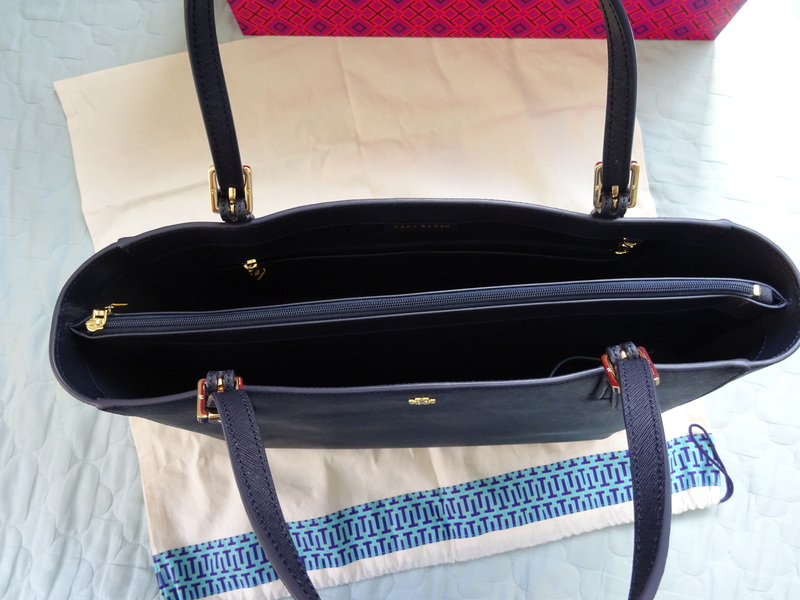 Some of the things that I looked for in my bag was for it to be big enough to carry my pocketbook, phone, charger, keys, notebook, tablet, makeup bag, water bottle, work heels, and possibly lunch – all without appearing bulky. It also should contain a compartment or two inside the bag to help keep all of my items organized. And because it is a part of my professional attire, I want the bag to look stylish, but not flashy, and sleek enough to go straight out to dinner or drinks at the end of the day. Finally, it shouldn’t break the bank! This means that I was aiming for a bag that was under $500. After many hours of research (like 5 hours too many!) online and checking some out in-stores, I’ve finally settled on and purchased my new bag! 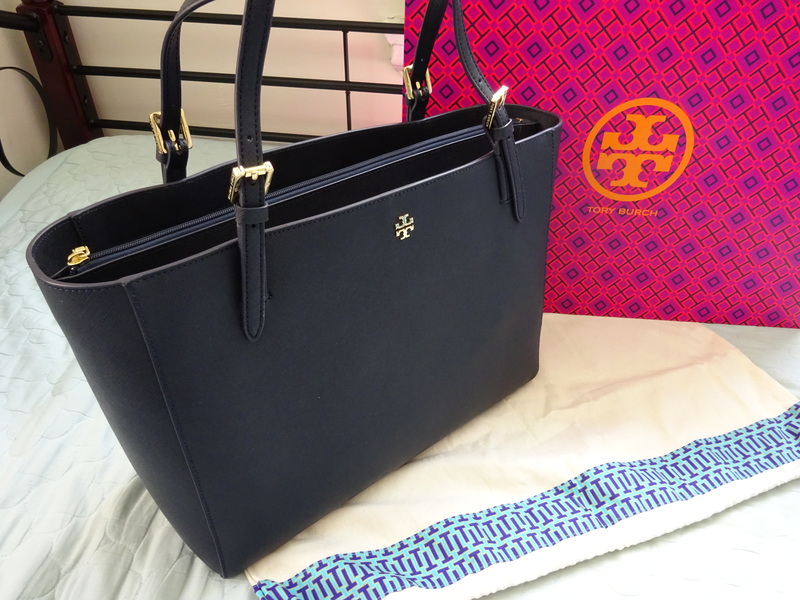 Here are some pictures of my new Tory Burch York Buckle Tote in the color Tory Navy. Despite my love for the colors New Ivory and Light Oak, I went with a darker color to prevent the bag from showing signs of wear and tear. The quintessential multi-tasking work tote, our York is stylish and super-functional. Made of the highest-quality, scratch-resistant leather, it has gold hardware and is designed to keep essentials organized. 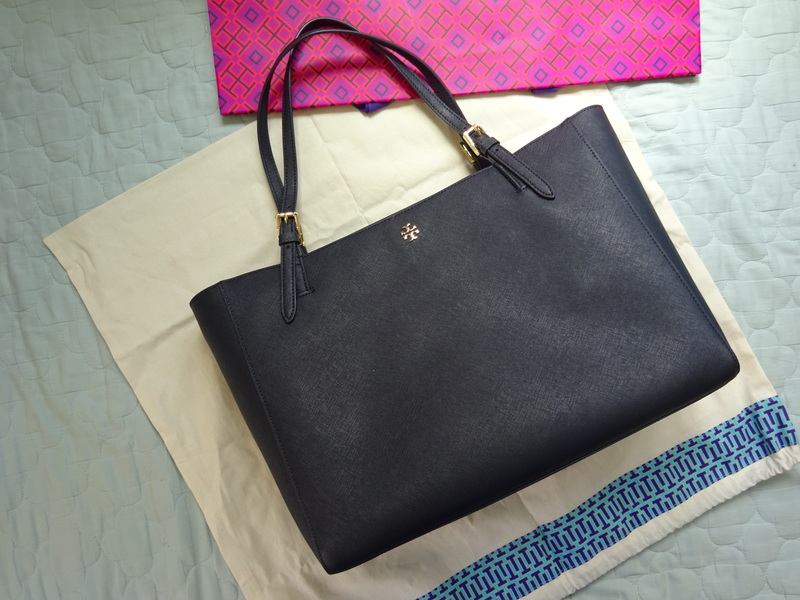 The interior features a fully padded compartment for a 15″ laptop, one large zip pocket, four open pockets for medium and small electronic devices, a ring to attach the matching York Smartphone Wristlet, a clip for keys, and enough room to add an extra pair of shoes. Finished with buckled straps, it’s clean-lined, classic and lightweight — ideal for the office, travel or days on the go. Interior padded zip compartment at center. 2 drop-in pockets on exterior of hanging zip. Flat leather shoulder strap with 9″ (23 cm) drop. Hi love, hope you are having a wonderful day so far! I just wanted to let you know I nominated you for the Sisterhood of the World Blogger Award. Instructions are on my blog! Thanks so much! The nomination means a lot to me and I will respond asap!